This guest post by Aamna Mohdin has been simulposted with EARA. There is a new effort to ban animal research in Europe. The Stop Vivisection European Citizens’ Initiative, and its 1.2 million signatures, has been submitted to the European Commission and the organisers have now been invited to discuss their petition. The initiative calls for “the European Commission to abrogate directive 2010/63/EU on the protection of animals used for scientific purposes and to present a new proposal that does away with animal experimentation”. The organisers will have the opportunity to present their ideas at a public hearing held by the European Parliament. The Commission now has three months (from March 3rd) to decide how to respond and explain their reasoning. Stop Vivisection is the third initiative to be successful under the citizens’ initiative programme, where EU citizens are able to propose and amend legislation to the European Commission. First introduced by the Lisbon Treaty, the citizens’ initiative programme attempts to make EU-law making more accessible and democratic. Each initiative must gain one million signatures across from at least seven member states, these signatures are then checked and validated by the Commission. Stop Vivisection collected 1,173,130 signatures across 26 of the EU’s 28 member states. 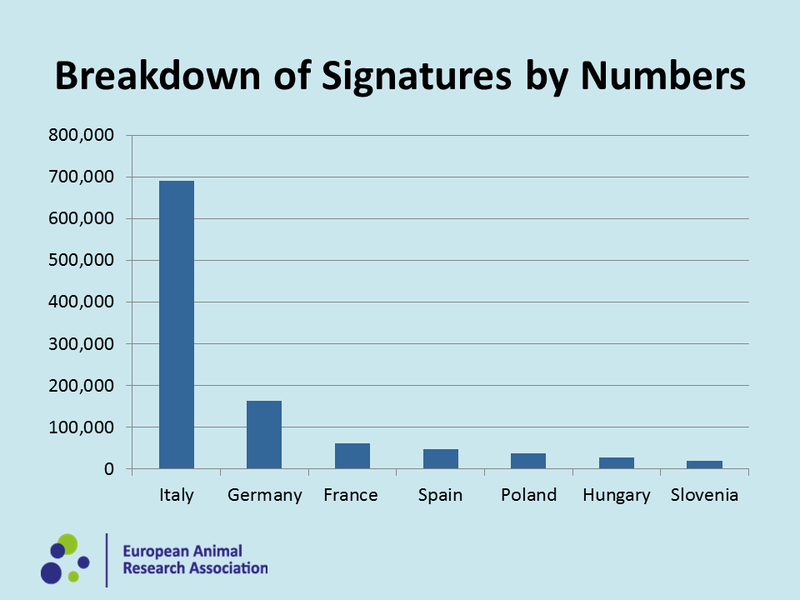 The majority of these signatures come from Italy – where anti-animal research sentiment has been running high -, and five out of the seven members of ‘citizens’ committee’ are Italian. This comes as no surprise as the anti-science movement continues to grow in Italy, with the government recently restricting the use of animals in research; forcing scientists to change the focus of their research or pursue their research elsewhere. These seven countries account for 90% of all the signatures. At the heart of the directive is the 3Rs—researchers must replace animals with alternative techniques when available, reduce the number of animals required in research, and refine procedures to minimise suffering. In response to the initiative, over 120 organisations—including notable learned societies, patient groups and leading universities— have signed a joint statement supporting European Directive 2010/63/EU. The statement calls on the European Parliament to oppose the ‘Stop Vivisection’ initiative as repealing the Directive will damage Europe’s leading role in advancing medical progress, which human and animals hugely benefit from. The European Parliament and Commission must oppose the ‘Stop Vivisection’ Citizens’ Initiative that is seeking to repeal the Directive and ban animal research. The Directive is vital to ensure that necessary research involving animals can continue whilst requiring enhanced animal welfare standards. Summary: The use of animals in research has facilitated major breakthroughs in medicine which have transformed human and animal health. We support research using animals where alternative methods are not available, where the potential benefits to health are compelling, and where acceptable ethical and welfare standards can be met. The Directive has enhanced animal welfare standards and introduced the concepts of refinement, replacement and reduction (‘3Rs’) across the EU, while ensuring Europe remains a world leader in biomedical research. The ‘Stop Vivisection’ Citizens’ Initiative must be opposed by the European Parliament and the Commission – repealing the Directive would represent a major step backwards both for animal welfare in the EU and for Europe’s leading role in advancing human and animal health. Research using animals has enabled major advances in the understanding of biology and has contributed to the development of nearly every type of treatment used in medical and veterinary practice today. Research on animals continues to be necessary to understand human and animal health and disease, and to develop and improve treatments for patient benefit across the world. Animals may be used in research under the Directive where the potential medical, veterinary and scientific benefits are compelling and there is no viable alternative method. The use of animals for testing cosmetic products was banned across the EU in 2009 and the importation and sale of cosmetics that have been tested on animals from outside the EU was completely banned in 2013. Refinement – methods which minimise any suffering and improve animal welfare. Developments for alternative methods to the use of animals in research, such as use of human cell models and computer modelling, continue to progress and the biosciences sector must continue to drive these forward. However, alternative methods are not able to fully replace the use of animals at this time. For many diseases, including complex conditions such as cancer, heart disease and diabetes, which affect multiple organs, we must understand how the whole organism interacts, which means that research using whole animals continues to be essential. We call on the European Parliament and Commission to reaffirm their commitment to the Directive. Any roll back from this would both undermine animal welfare and compromise high-quality research using animals. Such research is critical to advancing human and animal health in the EU and globally -and to maintaining Europe’s leading role in that endeavour. It’s important to remember that although the petition passed the one million threshold, it still only represents less than a quarter of one percent of the EU’s population. It’s therefore vital the scientific community remains open about animal research and opposes initiatives such as these to protect both human and animal welfare. Posted on March 5, 2015 May 5, 2015 by EditorPosted in Animal Rights News, Guest Post, NewsTagged European Directive 2010/63/EU, European Parliament, Stop Vivisection, Stop Vivisection European Citizens' Initiative. I’m only 14 + at school with some interest in Neuro Sciences but I completely support you opposing the anti-vivisection campaign and I agree with everything Aamna Mohdin says in the amazing article ”The Stop Vivisection Initiative – Trying to Ban European Animal Research”. Everyone should know + be taught at school about all the many benefits that animal research brings. To The European Government I say please don’t let animal rights extremists influence restricting or reducing animal research or ban vivisection!!! Many animal rights activists are in prison or have criminal records which says it all!!! (and shows they don’t have a balanced /reasoned view of the issue). Good to see that the medical research community is taking a firm position on this petition. There is grounds to be optimistic that the European commission will stand firm and place the rights of patients above the demands of pressure groups. Last year the European Commission rejected the “One of Us” petition which sought to ban research involving embryonic stem cells, and which was signed by 1.8 million EU citizens.